Earth is in a stable orbit around the sun because our planet's forward motion exactly counterbalances the gravitational pull of the sun at this distance (about 93 million miles). All orbiting bodies have achieved this balance between gravitational pull and forward speed. Since gravitational pull decreases with distance, objects farther from the sun move forward more slowly as they orbit. If the sun, earth, and a more distant spaceship all happened to be in alignment at some moment, the spaceship would soon drift behind (assuming it didn't fire its rockets), unable to keep up with the earth as they both orbited the sun. But there is one spot - on a straight line from the sun to the earth and nearly a million miles beyond - where the sun's gravitational pull combined with that of the earth are just enough so that, to balance it and remain in orbit around the sun, a spaceship must move forward faster than it otherwise would at that distance from the sun. And with this increased speed, the spaceship just exactly keeps up with the earth as they both orbit the sun. Sun, earth, and spaceship remain aligned. 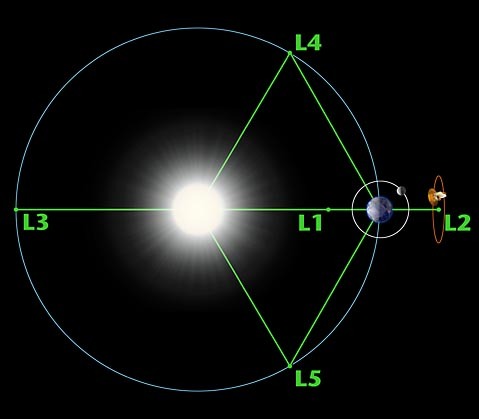 Lagrange Points L1 through L5. This spot is called the earth-sun L2 point, the second of five "Lagrangian Points" named for Joseph-Louis Lagrange (1736-1813) who calculated their existence. In practice, a spaceship is actually more stable orbiting around the L2 point than trying to remain at the precise point. But the effect remains the same. Wherever earth happens to be in its annual path around the sun, an L2 spacecraft would be positioned a million miles above the night side of the planet. And with the sun and the earth at its back, a telescope aboard the spacecraft would always have a clear, uninterrupted view outward into the Universe. More on Lagrange Points can be found at the Wilkinson Microwave Anisotropy Probe (WMAP) website.